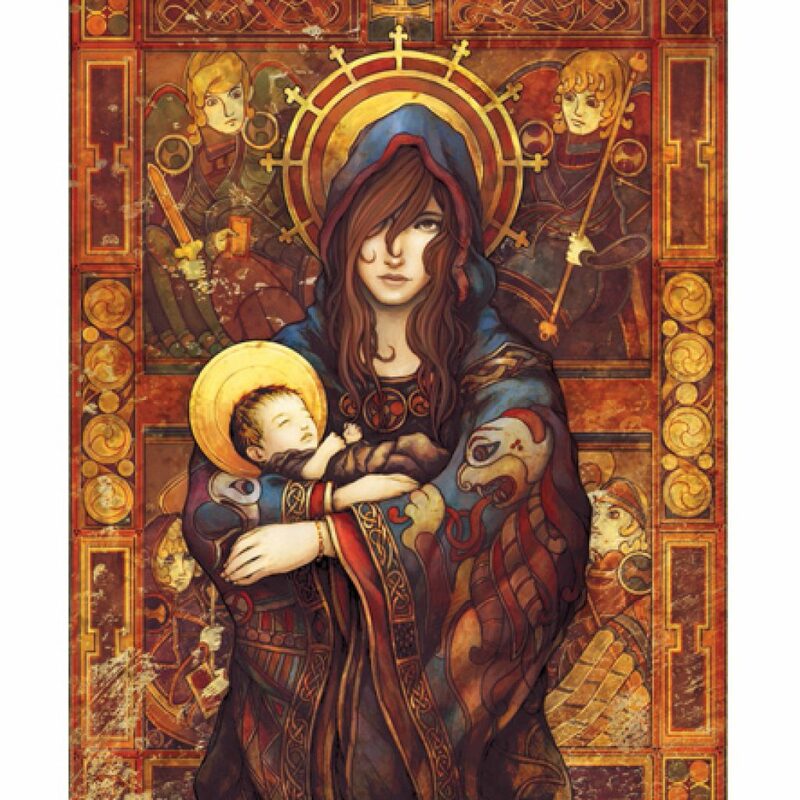 View cart “Map of Israel – exclusive artwork from “The Gospels”” has been added to your cart. 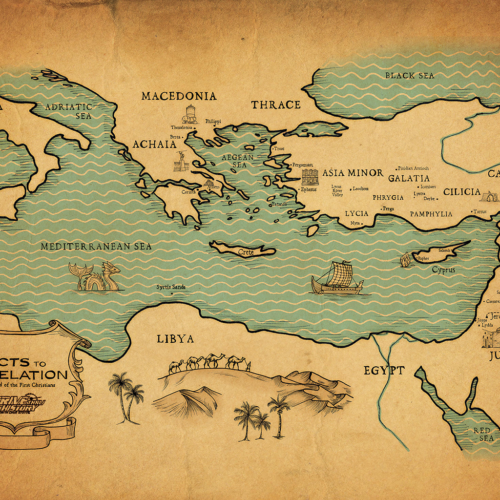 These 18 action -packed episodes delve into the history, archeology, geography, and art surrounding the birth, ministry, death, and resurrection of Jesus. 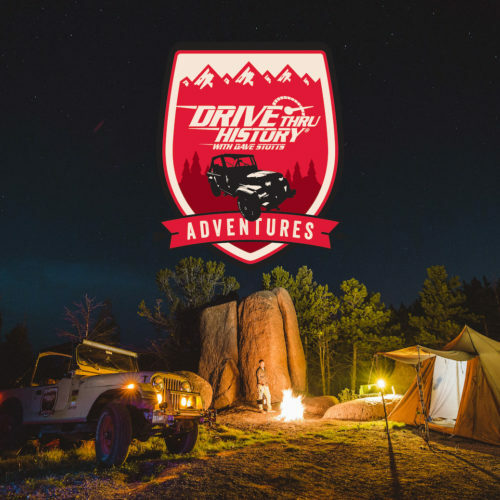 Like you’ve come to expect from Drive Thru History®, these shows are fun, adventurous, and family-friendly. Very well written and expertly presented. GOD has used the people who prepared this series to shed light on the people, the times, and the places of our savior during his human appearance. This series is one of the most inspiring and informative I’ve ever seen. And Dave is pretty great too. The editing is excellent and the music is worthy of a sound track, as I shared with David in Colorado. This is Drive Thru History. This is awesome. This is Biblical history brought to life today! Dave and the ColdWater team have hit the mark every time with everything they have produced. The Gospels will be no exception! The only thing dry here, is the dust on Dave’s Jeep! Whether you are 7 or 107, I hope you enjoy the series as much as I have! Buckle up and hang on for a wild ride as you laugh, learn and “Drive Thru History”! I have yet to buy the DVD but saw this series on TV. Dave brings a unique presentation of the gospels that keeps you riveted. No matter how many times you have read the Bible you miss the background history . Dave does this through this series. I highly recommend you watch this series. My thanks to Dave. What a beautiful series. I watched them on TBN. Very nicely put together. Detailed and to point according to the scriptures. 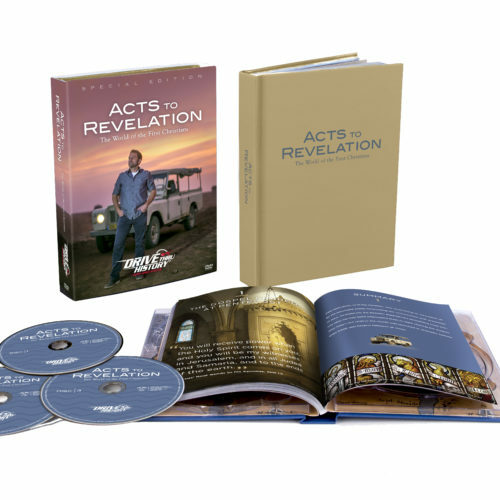 I have learned so much through this entire series and that he recorded all this in Israel. If you haven’t seen this you must. Wonderful job Dave Stotts you didn’t leave out anything. The best. GOD is so blessed. Great historical value, with a touch of respectful humor…should be shared and taught in schools and churches around the world. I’ve already had the privilege of using episodes to stop the gainsayers who are so wrongly taught…that history proves these men really lived. It simply comes down to each persons free choice to believe that Jesus was the son of Almighty God or not. If you believe it. ..then it’s truth and you can receive the same power. And if you don’t believe it’s true…well, then ask God to help you change your mind. For noone comes to God and eternal life without Jesus Christ. Powerful and Inspired job Dave…what’s up your sleeve…and in your spirit for next season? The series on TBN was outstanding. I can’t wait to get the entire DVD series .so I can watch it again and again. I hope the epilogue can be bought separately in addition to the 4 Gospels. Jesus even more. Thank you for a job well done! I really hope the epilogue can be puchased separately, as these would be great to give as gifts! God Bless You All!! 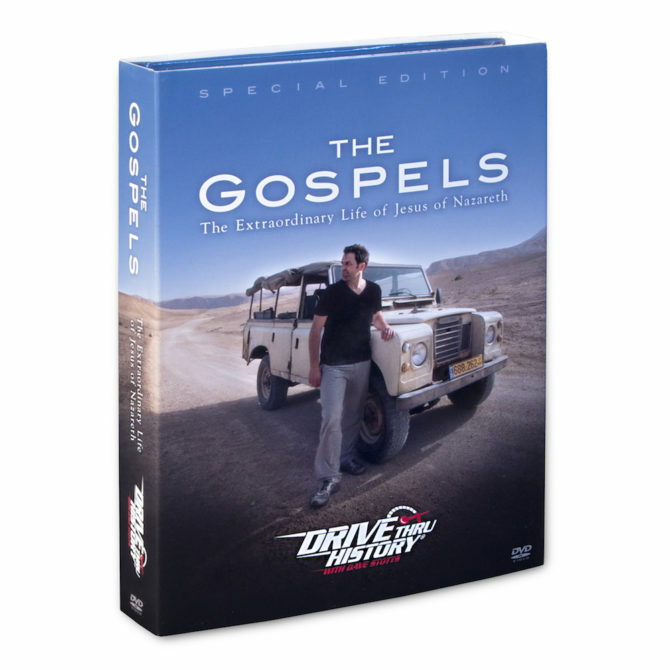 I first discovered Drive Thru History two years ago when I came across The Holy Land series on TBN. Each inspirational episode brought me even closer to Jesus and the footage shot on location, along with the graphics and Dave’s explanations, brought the scriptures to life. Dave makes learning fun, but I take him seriously too because I know he is very educated and is truly passionate about Jesus. I received The Gospels on DVD, along with the 118-page book (nicely packaged!) and am thoroughly enjoying each episode. It’s like walking through the bible! What a gift! Now that I have The Gospels series, I will be buying The Holy Land series on DVD too and will watch/share both series several times over. Thank you Dave and the entire team at Cold Water Media for all your hard work. I’m sure there have been risks filming throughout Israel considering today’s political climate, so thank you for doing God’s work to spread the Good News. God Bless. Very educational and also keeps attention. We’re using this for our homeschool curriculum and have to tell the kids not to watch them all in one sitting! So entertaining and Dave is such a great guide. Thanks for putting this together! I have seen The Gospels series on TBN, and will soon be ordering the DVD series. Dave and the Cold Water Team offer a modern way of bridging the gap in getting to know Jesus Christ, and the locations he visited. The cinematography is beautiful, with gripping story-telling, and a sense of actually being there. Mixed with Dave’s reverence and zest for appropriate humor and grace. The information packed within each half-hour episode is just enough to allow the viewer time to learn the material, while not becoming distracted. This series reminds me of early experiences in trying to get to know Jesus Christ. That process often times burdened and sidetracked due to human interpretation, and personal embellishment. That is no longer the case with The Gospels series. As a viewer actually learns the facts, and is fully engaged mentally and spiritually by the way the message has been delivered. The best series yet! Great adventure learning! 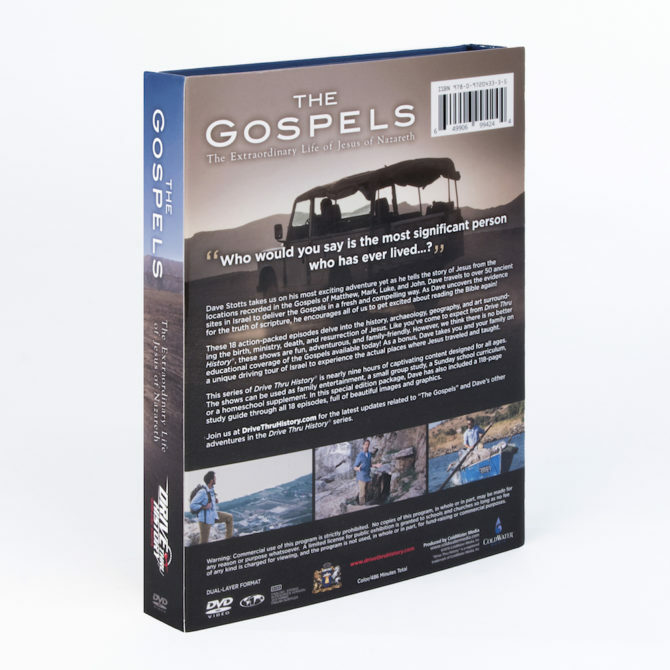 A powerful way to go through the Gospels as a family, classroom, small group, or Sunday school! Thanks! Incredible! This is the definitive teaching for the Gospels in the 21st century! Sure there’s good teachings out there but compared to Dave Stotts they are soooo boring! What’s better than Truth and Humor?!? Whether it’s for you, your spouse, your kids, teens, extended family, parents, new believers, pre-believers, or long time believers this is hands-down the single best way to enjoy the awesome biblical scenery of the Holy Land while learning more than you can imagine! I have seen nearly everything in the last 15 years as the CEO of AllAboutGOD.com–this is THE BEST presentation of the Gospels I have ever seen! Candy and I could not stop watching “just one more!” Do yourself a favor by starting the first show early in the night otherwise it’s going to be hard to get up the next morning! So well done! Couldn’t wait for next episode to air. Love this video format. Educational, fact paced, and visual. Plus Dave is witty and from Texas! Going to buy my next “Drive thru ” today……………Produce more ! Watched the Gospels on the JUCE network, recorded all episodes on DVR to watch over and over. Thank you God for the believers you use to touch the other believers to draw us closer to you and to bring those who may not know you…to your marvelous light. I will be purchasing the DVD set shortly because this Teaching is so necessary to share with others. Wonderful blessing to Dave and your team! 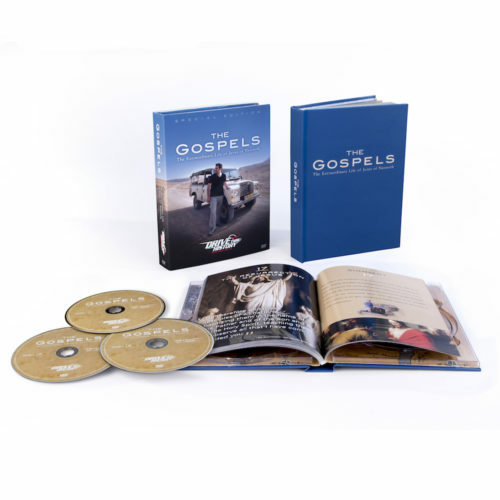 I watched the gospels and Holy Land- Drive Thru History on TBN and I absolutely loved it!! Very informative,humorous (thank you Dave and team)and a must for youth and adults to learn the history and cultural backgrounds of our wonderful Savior Jesus!! Intrigued with the series and want to review it time and time again! This was an excellent tool for our Bible study group to read through the gospels. The historical and archaeologic presentation helped take the gospel message from some vague thing to believe in, to factual, historical truth to know, trust in and stand on. I was a bit disappointed in the first few episodes because it was more about Roman history with a little too much silly filler for my liking. Once it got past the “carbaque”. each episode was more closely tied to the text that was being read by our group. It grew more powerful and faith-affirming with each episode. The last few episodes were stunning, and the epilog really demanded a decision of the viewer. Thank you so much! I’d love to see a follow up about the book of Acts. A fantastic, top of the line, teaching and learning resource for sure, the grandkids along with us grandparents just completed the 18th episode together. 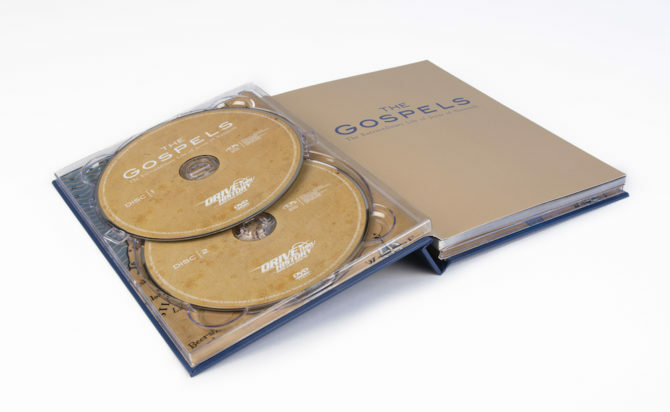 This comprehensive and engaging exposure to the Gospels brings to light many true historical aspects in concert with Scripture and in a captivating manor too, which add to the richness of the Truth of the Gospels; Visually viewing where it all took place ads a very powerful dimension when teaching kids. We read the associated Bible readings before watching the DVD and did the Q&A after the video, just as laid out in this great presentation. Thank you to Dave Stotts and DTH team for another valuable and entertaining Truth tool. Just finished watching this on TBN. Fantastic entertainment with strong Biblical foundation. His epilogue pointing to all the Old Testament Prophesies relating to Jesus as Lord and Messiah really pulled it all together. We have used Dave’s series to build a Care Group in our church. A lot of folks have been in the church for many years and heard hundreds of sermons on the gospels. But everyone in our Care Group has learned way more than they expected. This is a great series on every level – from young adults to seniors, everyone walks away with a greater understanding and a deeper relationship with The Greatest Man Who Ever Lived. Our church Community Group studies Biblical teaching in the context of history. We’ve been doing this about five years. Drive Through History hasn’t been our only source of info, but it’s been a mainstay. We all agreed “The Gospels” is DTH’s best work so far. As we worked through the series, group members frequently said how much they enjoyed and learned from presentations. Thanks for investing your time, talent and resources in this project…and in all of us who’ve had the privilege of viewing it.